When Rick Perry stepped down as Texas' longest-serving governor in January, he turned his attention to a post-gubernatorial checklist that first and foremost included preparing full-time for a presidential campaign, one he is expected to launch Thursday. Also on the list was making some serious money as a private citizen for the first time in nearly three decades, unfettered by the constraints of being an elected official. Fresh off the state government payroll, Perry quickly turned to two tried-and-true ways of cashing in on a long career in public service: taking a seat on a corporate board and hiring out for speeches. A full accounting of Perry's post-gubernatorial finances will not be known for a while — if at all — but if experts and estimates are to be believed, it appears retirement from public office has served the former governor's bank account well. The post-gubernatorial haul has given Perry a nice chunk of change as he travels the country building his national profile ahead of Thursday. But it's not necessarily a windfall compared to Perry’s time in the Governor’s Mansion, when he made $150,000 a year. In at least one of those years, he took home more than $90,000 in pension benefits through a loophole state lawmakers are now on the verge of closing. While he's expected to give up paid speeches — at as much as $45,000 a pop — after he formally announces Thursday he is running for president, Perry does not plan to resign from the board of Energy Transfer Partners, a Dallas-based pipeline company headed by longtime Perry supporter Kelcy Warren. Corporate board memberships have been in the 2016 spotlight thanks to former Florida Gov. Jeb Bush, who late last year gave up all his positions as he moved closer to a presidential bid. But Perry spokeswoman Lucy Nashed said he does not plan to step down. Ryan McConnell, a Houston lawyer whose specialties include corporate compliance, said Monday there is no corporate law or rule prohibiting board members from running for office. But he cautioned that in the heat of a presidential race, the gig could be easy fodder for opponents. "Optically, you’re just giving one other issue to folks who like to criticize the governor and other candidates to talk about," McConnell said. "If you give them something to talk about, they're going to talk about it." In its annual report for 2014, Energy Transfer Partners said Perry was selected to join the board "because of his vast experience as an executive in the highest office of state government," as well as his experience in "finance and budget planning processes throughout his career in government as a member of the Texas House Appropriations Committee, the Legislative Budget Board and as Governor." The company will not be required to disclose how much Perry is making until several months from now, when it must file its annual report for 2015. However, a company spokesman said Perry's compensation can be expected to be "along the same lines" of what it was for board members last fiscal year, when their earnings ranged from $165,000 to $214,100, according to SEC records. "It's not bad money to get," McConnell said, estimating board members of large companies on average earn $250,000 a year. "And the job certainly is not one as onerous as his former job." But the new gig does come with some political baggage. A unit of Energy Transfer Partners is pushing to build an oil pipeline across early-voting Iowa, where Perry is staking his hopes as he plots a comeback bid for the White House. Pipeline builders have asked the Iowa Utilities Board to use eminent domain, a pending request that has added property rights advocates to the scores of environmentalists already rallying against the project. Among the Iowa lawmakers leading the charge against the pipeline is sophomore state Rep. Bobby Kaufmann, a Republican for whom Perry stumped last year. In March, Kaufmann called Perry's involvement with Energy Transfer Partners a "bad idea," suggesting it could hurt him in the caucuses. "Politically speaking, I am not sure there is as much upside for him to be involved as there is downside," Kaufmann told DeSmogBlog, a climate science blog. "People would likely not vote for him for being involved with the pipeline." Whether Perry actually has taken a position on the pipeline is somewhat in dispute. Although his Iowa spokesman has said he would not publicly advocate for it, pipeline opponents say he did just that during an interview that aired Feb. 1 on Des Moines TV. On its website, WHO-TV wrote that the exchange shows Perry discussing "why Iowans should support efforts to build the Bakken Pipeline." In the actual interview, though, Perry is less explicit, and the closest he comes to directly addressing the pipeline is saying he is fine with eminent domain being used as long as landowners are "appropriately compensated." In a town hall two weeks later at Morningside College in Sioux City, Perry made clear he would not get involved in the debate over the pipeline, saying he trusts Iowans to decide what is best for the state and hold their elected officials accountable. He was nonetheless pressed about his involvement with Energy Transfer Partners, at one point bristling at the suggestion it could cloud his ability to represent ordinary Americans. "The issue is ‘Do you believe the Public Utility Commission in Iowa will make the right decision where a pipeline’s going to go?’ Not whether or not there’s someone who sits on a board,” Perry said. "I think that’s irrelevant, frankly." Unsurprisingly, the pipeline's critics see it differently, pointing out some of the fiercest critics of the project are rural Iowans who tend to vote Republican. They also cite a Des Moines Register Iowa Poll from April that shows nearly three-quarters of Iowans are opposed to using eminent domain to build the pipeline. "It's going to hurt him big time," said former Iowa state Rep. Ed Fallon, who hiked across the state in March to draw attention to his opposition to the pipeline. Yet he and others acknowledged Perry's board membership is not exactly common knowledge to the average Hawkeye State voter. "When that gets out, it's going to be a jaw-dropper for some people. It hasn't been talked about that much." Pamela Alexander, who owns land in one of the counties the pipeline could run through, did not seem to buy the idea Perry was neutral on the issue. If he sits on board of Energy Transfer Partners, she said Monday, "he is sure going to be in favor of everything they want to or not want to do." "I'm not a very political person, but this pipeline is forcing me to become more aware," said Alexander, who considers herself an independent. "I will be out voting against and campaigning against some people on this issue next election." Perry's speaking gigs have been far less controversial, putting him in front of friendly audiences eager to hear about Texas' economic success story. A few weeks after leaving office, he signed on with the ubiquitous Washington Speakers Bureau, making himself available to discuss a wide range of topics at joint presentations, keynote addresses and panel discussions. Unlike what it does for some speakers, the bureau did not publish on its website a so-called fee range of how much it costs to host Perry, instead asking on Perry's page for interested parties to inquire. That page was no longer on the bureau's website Monday. Harry Rhoads, the head of the notoriously tight-lipped agency, did not return calls and an email Monday. Perry has given three paid speeches since leaving office, Nashed said Monday, some better publicized than others. He is currently scheduled to give another speech in California on June 11 at the 24th annual Western Riverside Council of Governments General Assembly and Leadership Address. Perry's fee was set at $45,000, paid from private funds, said Jennifer Ward, a spokeswoman for the council, a regional alliance of local governments. 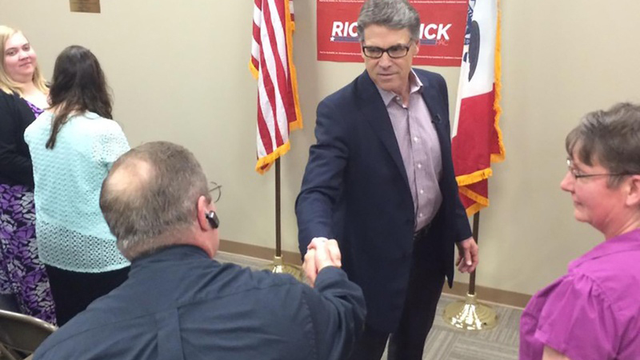 Whether Perry's presidential announcement will change that arrangement is unknown. Another paid speech found Perry in battleground Ohio on April 30, addressing a crowd of about 500 people at the John M. Ashbrook Memorial Dinner at Ashland University, a private school about an hour outside Cleveland. As part of his contract — a price tag for which was unavailable Monday — Perry agreed to spend time with some students before the dinner, said Christine Gorey, a spokeswoman for the Ashbrook Center. The former governor, she added, "did an excellent job."